All but written off by some of the self-­anointed tactical illuminati, the humble metallic sight system isn’t leaving us any time soon. Ask any five shooters what their favorite sights are and you’ll likely get at least four different answers. However, one thing they will have in common is that the sights should be made of iron, or steel, to be more specific. Many companies have toyed with and still use polymer (and some aluminum) for sights, but over time all of those have been found lacking in the durability steel offers. Durability, which is so necessary on a fighting gun, is what’s going to keep irons appearing on new handguns for a long while. As much as I truly believe that mini-red-­dot sights (MRDS) are the future, electronics can still fail. What causes a red dot to fail? A pistol’s recoil signature puts far more strain on electronics than even a rifle. MRDS mounted on reciprocating pistol slides fail at a much higher rate than fixed rifle-­mounted dots. So, what kind of iron sight is best in the world of tritium, big dots and fiber optics, you ask? (Even brass beads are coming back into vogue) The answer is going to depend on what works best for you. You can also bet that it’s going to change and evolve as you advance as a shooter. More than 20 years ago when I was a young police officer, all of the so-called “gunfighters” used Trijicon’s tritium sights on their issued Beretta pistols. However, all of the true handgunners had Aristocrat sights on their’s. Common thought at the time was that the tighter front sight to rear notch layout of the Aristocrats allowed for a more precise shot. Theoretically, that may have been the case, but I sure couldn’t see the advantage. I tried and tried to be a cool kid and love them, but even back then I preferred Trijicon’s because of the generous rear notch. During the last 25 years of coaching and shooting, I have found that more light in the rear notch is a good thing. Even a novice shooter does better under stress with a generous rear notch. I’m happy that with the proliferation of peer-­reviewed use-of-force reports, the industry has moved in that direction, too — in a big way. Needing irons is one thing, but truly understanding irons is another need altogether. For many shooters, adjusting dovetail sights lies somewhere between physics and voodoo. Adjusting your sights is a topic that I could write a manifesto on, but, in short, there’s a couple of points to remember: One, when adjusting the rear sight, the direction you move the sight is the direction the round will move on the target. This is for both windage and elevation. When adjusting the front sight, it is opposite for both windage and elevation. For example, if you were to shoot a group that was low and to the right, you would adjust the rear sight up and left. For that same group, you would adjust the front sight low and right in order to bring the group up high and left. Don’t worry about getting it correct at first, it confuses even experienced shooters. Adjusting irons in dovetails makes it even more complicated because you might find that you need to change the front or rear sight for another of a different height. For a long time, I was heavily invested in the Glock platform, so I carried a sight pusher for the rear sight and a little bag of tools for the front sight, depending on the generation of the pistol. These tools were great because I could adjust a student’s gun on the fly, assist peers that weren’t quite as dialed in and generally be a good help on the range. It also ensured that my personal pistols were always zeroed. As the list of my department’s ­approved pistols got longer and longer, I found myself with several tool kits and sight pushers in my bag, which made for a heavy, noisy and otherwise unwieldy mess. I carry enough stuff as it is, and the last things I need in my range bag are three different sight pushers and random punches and wrenches. I’ve tested several so-called “universal” sight pushers in my career. To be honest, I found them all lacking. They were either too heavy or too flimsy, or they would do well with one slide type and not another. Perhaps, you can share my frustration. I had all but given up on the concept, until a conversation with G&A Editor Eric Poole on this topic piqued my interest again. He recently spent time evaluating the Wheeler Engineering Armorer’s Handgun Sight Tool and thought it might be a viable solution for me. So, I ordered one. At $193, it isn’t the cheapest tool, but on first inspection I was impressed with how well thought out it was. It weighs a hair under 4 pounds, so it’s substantial enough for heavy use as a professional armorer’s tool, but it also fits nicely in most of my large range bags, replacing the other three. Anodized with an attractive gold finish, it not only looks good, but the finish helps to provide contrast with the slide, which allows easy viewing of the task at hand. There are four large clamps on the bottom that allow most slides to be captured firmly, and they are easily adjusted by means of the oversized, knurled control knobs. Once the slide is fixed in position, it’s not going anywhere. The top carriage of the tool is then lowered over the top of the slide so that the height adjustment stop contacts the top of the slide and the pusher is centered over the front or rear sight, depending on the user’s preference. Once the adjustment stop is in place, the top carriage is secured using another two oversized knobs to tighten it down. A simple turn of the adjustment wheel then moves the sights in the desired direction. Adjusted properly, there is no slop or wiggle in the tool and absolutely no marring of any of the slide surfaces. All of the adjustment screws glide smoothly, all of the surfaces mate perfectly, and the precision of the tool is evident. My very first use of the tool was to install a new set of XS Sights F8 night sights on my Glock 43. The whole process took less than five minutes. Lucky for me, the centered sights shot right to point of aim the first time. I brought the tool to my home range and during the course of a day I used it to adjust two Glocks, a Smith & Wesson M&P, a CZ 75 and a 1911. The tool performed smoothly and quickly each time. 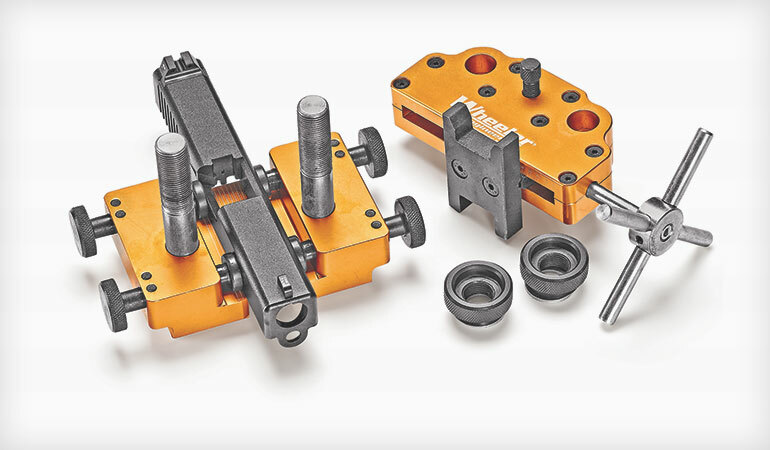 Even fine adjustments are possible due to the level of precision that Wheeler Engineering designed into the tool and threads of the screws. 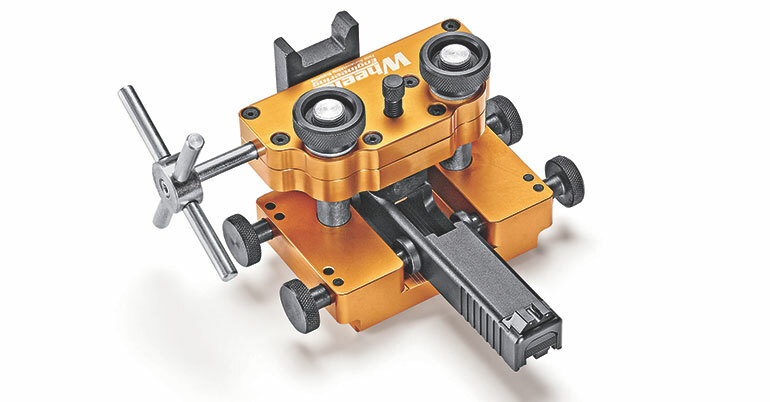 If you have the need to adjust several different pistol sights, the Wheeler Engineering Armorer’s Handgun Sight Tool should be the last sight pusher you ever need buy. And don’t let anyone convince you that iron sights are fading away. A good set of properly aligned metal sights will always be ready when you need them.